Sunset, from the lava fields north of Flagstaff. 2018 has been a year of transition for me. Susie, the woman who challenged and changed my way of looking at the world (as expressed in my August 2017 blog “In love with Photography”) proposed to me in January; we married in June outside of the Great Sand Dunes. Within a few weeks we sold both of our houses in Colorado, while buying a new home in the Ponderosa forest south of Flagstaff, Arizona. Susie and I had debated and discussed the move; we will miss the one-of-a-kind scenery of the Colorado Front Range, and I particularly will miss the proximity to alpine country at 14000 feet. Ultimately we decided the best move for our careers, our family, and our partnership was to make the move to northern Arizona. Flagstaff, at 7000 feet, offers a lot of the same benefits of living in Colorado along with the proximity to world class scenery. With change comes opportunity. 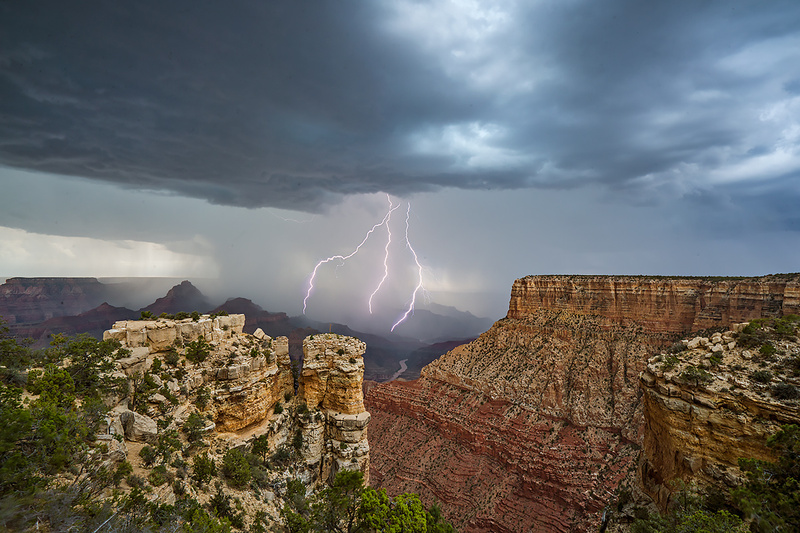 Lightning from a monsoonal storm at the south rim of the Grand Canyon. Within a couple weeks of moving, in between unpacking boxes and setting up the new home, we made our first trip to the Grand Canyon, less than two hours drive from home. We were greeted by a magnificent storm moving through the canyon, and followed the deluge to the west until we exited the park and celebrated our good fortune with beer and pizza in Grand Canyon Village. 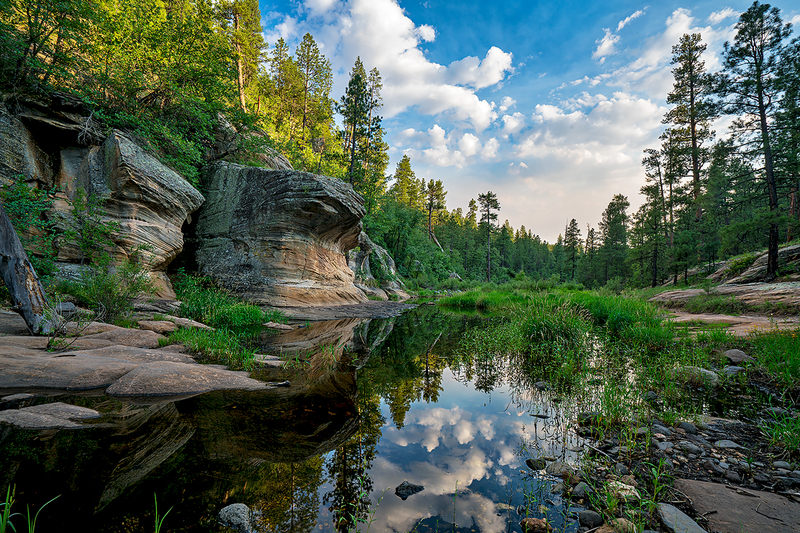 Since then, I have spent many days scouting the canyonlands south along the Mogollon Rim, and especially around the wonderful town of Sedona, which I had never visited before this move. 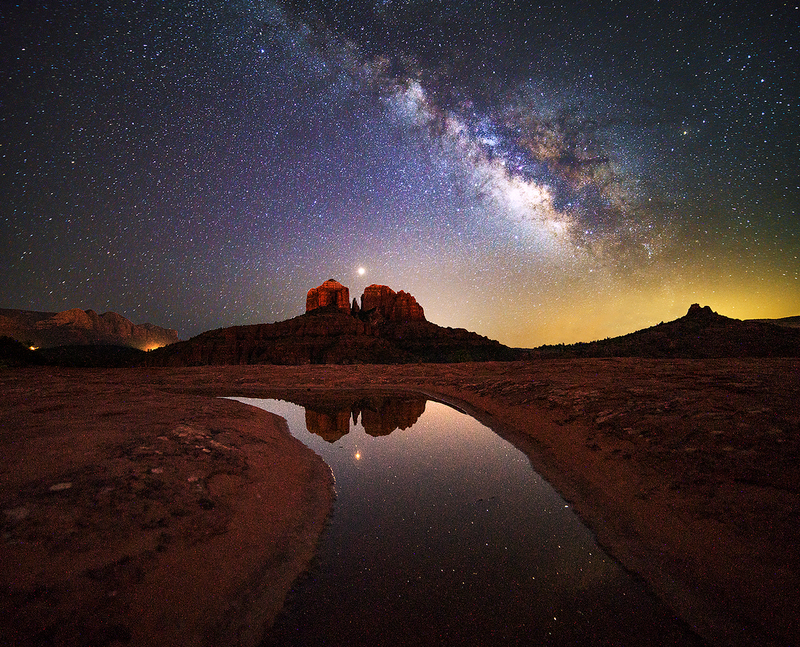 Mars rises over Cathedral Rock in Sedona on a quiet night in August. Even the relatively unvisited areas within just a few miles of home have proven to be a fruitful source of new scenery, new visions, and new ideas. The thrill of new discovery calls me to seek out both the hidden and obvious beauty that fills the landscape in the Desert Southwest. Over the coming months I will continue to challenge myself to find and reveal nature’s art, and with new beginings comes a new opportunity to fulfill my goals of bringing the joy of discovery and the lesssons of art in photography to a wider audience. Change is good, when you let it bring you growth and happiness.